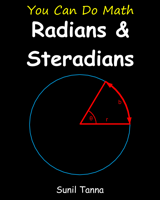 Below are details of my book, "You Can Do Math: Radians and Steradians". This book is now available both as a paperback book, and for the Kindle (electronic book - eBook). If you would like to read the Kindle (eBook) version, but don't have a Kindle reader, then you need to install the Kindle app software on your PC/Mac/iPad/etc., and then search for the book within the app. Here are some instructions for installing the Kindle software on your PC. Radians are the preferred unit that mathematicians and scientists use for measuring angles. Likewise steradians are the preferred unit used for measuring solid angles. This book explains the key concepts behind radians and steradians, as well as how to perform mathematical calculations based on these units (including many worked examples, questions for you to do yourself, and answers to those questions to check your results). This book has been specially prepared for use on the Kindle - including taking great care to ensure all math symbols, formulas, and calculations display correctly on the Kindle screen (many other math books do not display math symbols correctly). A color screen is recommended, but not essential - there are a couple of diagrams where the text refers to colors in the picture - but these should still be understandable even on a black and white screen. Download Now/Buy Now! buttons buttons used on this website, are from the CB Vendor Graphics Pack. This web site is owned & operated by Answers 2000 Limited.